Visited a restaurant that I park in front of a least once a week for a morning run. I see it when it’s dark out and there is nobody around but my running partner and me. So we had this novel idea to go check this place out during daylight hours when they are actually open. It’s The Daily Dish in Silver Spring/Chevy Chase, MD. We went at lunch on a Federal Holiday and it got pretty busy, which was good to see. We started with one of their seasonal special, some pumpkin hummus. Too…good, needed…more. 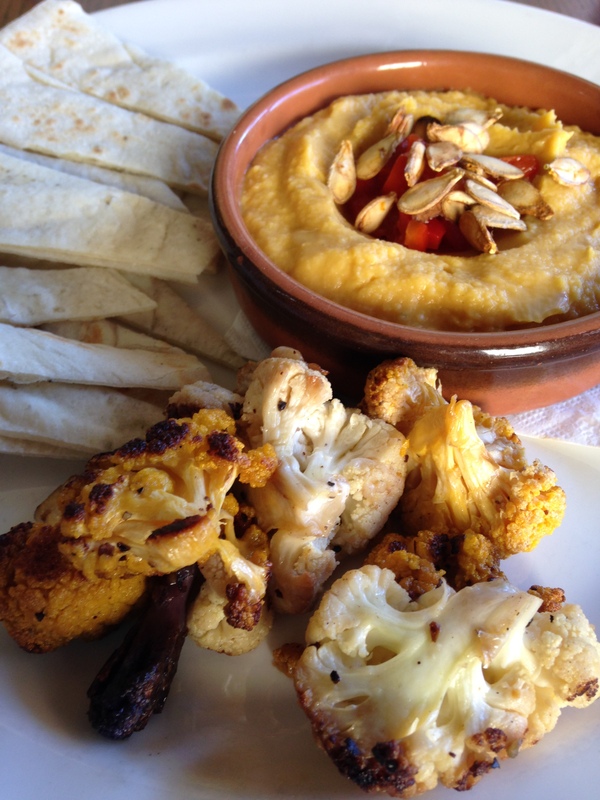 It was served with roasted pumpkin seeds in the middle and roasted cauliflower on the side, as well as the normal pita bread. 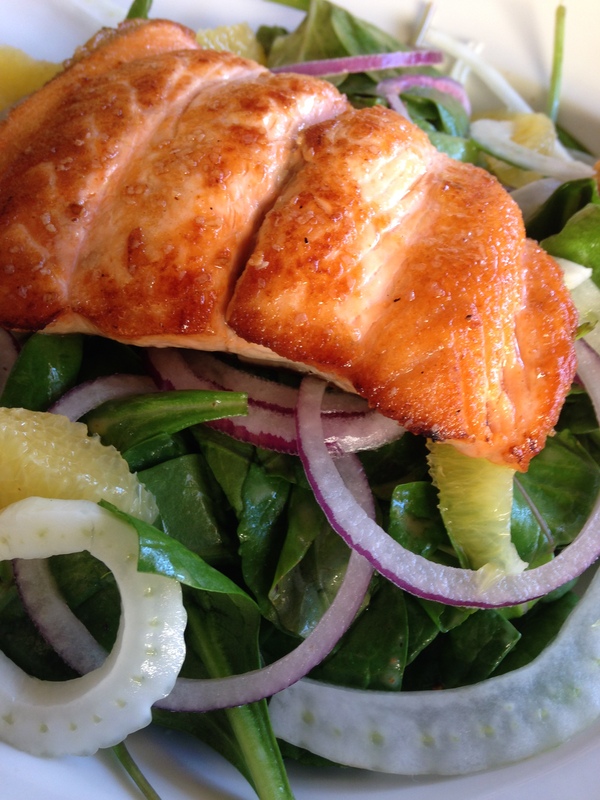 After debating the menu for awhile, my friend opted for a salad with pan-seared salmon, on spinach, arugula, fennel, with orange segments, red onion, citrus vinaigrette. I opted for the couscous paella (with shrimp for an extra charge). It was Israeli pearl couscous, peppers, zucchini, yellow squash, red onion, artichokes, marinara sauce served with quinoa. My friend’s salad was delicious. My paella was ok. 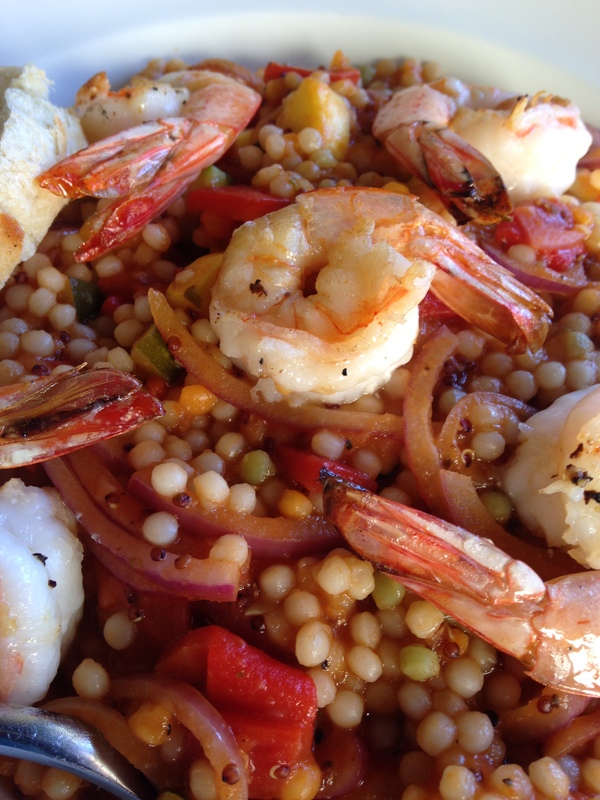 The veggies were nice and crunchy, the shrimp were perfect, but there was far too much couscous to be had. We also each enjoyed a glass of wine. I just remember mine was a Shiraz/Pinotage blend…can never go wrong with Pinotage! Overall good lunch experience. I’ve heard the restaurant can be hit or miss. They have a wide variety of options on the menu so definitely worth checking out. This entry was posted in lunch, restaurant and tagged chevy chase, daily dish, dinner, lunch, paella, restaurant, Salmon, silver spring. Bookmark the permalink. We had the same experience hit or miss and have not been back because of it.